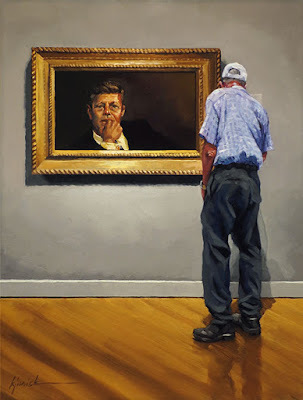 I first saw Jamie Wyeth's Portrait of John F. Kennedy in person in the National Portrait Gallery in Washington DC - the painting now hangs in the Museum of Fine Arts Boston in their permanent collection. It is exquisite. Jamie Wyeth was 20 years old when he was approached by the Kennedy family to paint a posthumous portrait in 1965. Wyeth spent the next two years creating preparatory drawings, joining senators Robert and Edward Kennedy on their campaign trails to pick up on shared family traits and mannerisms. There are brilliant nuances in Wyeth's portrait - one eye is directed to the viewer, the other slightly looking into the distance - his clenched fist in front of his mouth, a gesture Jacqueline Kennedy considered 'strikingly accurate'. It was said Robert Kennedy wasn't fond of the portrait, who felt 'his brother's disconcerted look was a painful reminder of his uncertainty during the Cuban Missile Crisis and Bay of Pigs invasion'. In the end, the official White House portrait went to another artist, Gardner Cox. Imagine yourself in coastal Maine, around 1911, one of the privileged few who spends the summer days watching boats races, dressed in fine, elegant clothes - enjoying the prosperous times without a care in the world. Those were the images painted over and again by the American artist Frank Weston Benson. One of those, Summer Day hangs in the Crystal Bridges Museum of American Art in Bentonville, Arkansas. In 1901, Benson resided in Salem, began renting and later purchased Wooster Farm, one of the enormous homes built for the upper class who summered with friends and family and servants on North Haven Island, Maine. Summer Day depicts Benson's two younger daughters although he originally included his oldest daughter, Eleanor, but later removed her - according to several curators - to simplify the composition and open up the horizon of the glimmering light of the sea. It is speculated Eleanor, who just returned home for the summer after graduating college had been introduced to and espoused to liberal views known as 'parlor pink' - a derogatory term to mean one has leftist or socialist sympathies. Pink meaning a lighter shade of red, thus a lighter form of communism. Mr. Benson was not happy. Removing her from the painting may have been his way of separating Eleanor from his younger, 'untainted' daughters. Featured in my new painting is Pablo Picasso's Girl Before a Mirror, painted in 1932. There are few paintings of the 20th century that have been analyized, interpreted, reanalyized as much as this work of art. 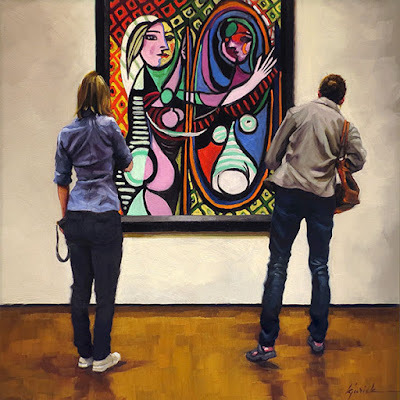 Really, just Google 'analysis of Picasso's Girl Before a Mirror' and you'll get over 8,000 articles. My observation, women are very drawn to it. It represents vanity, self-image - what we see when we look in the mirror. That's the easy interpretation. Then it gets complicated. The model for Picasso was his young mistress Marie-Therese Walter, whom he painted numerous times. Her real self on the left is brightly colored, beautiful, firm breasts, possibly pregnant while her reflection in the mirror is painted roughly, darker colors, her body more contorted, aged. Some say it's her confronting her mortality, her future, her fate. Some say it represents the anxiety of the times, rumors of wars, the world economy, fear and instability - the suppressed, real feelings deep down in one's heart. In the daytime, we're vital and presenting beauty and confidence and at night we're fractured and anxious, fearing our fate. Sound familiar? I don't usually analyize art. I react - with pleasure due to the composition, colors, skill of the artist, etc, or the opposite of all those things. Part of me always considers Picasso's renderings of women to be an example of the man himself - admiring youth and beauty, some say misogynistic and/or chauvinistic, hypersexual. At least that's what people tell me. I just finished this new painting. Yikes. It took almost an entire week but I was determined to conquer it (pun intended). 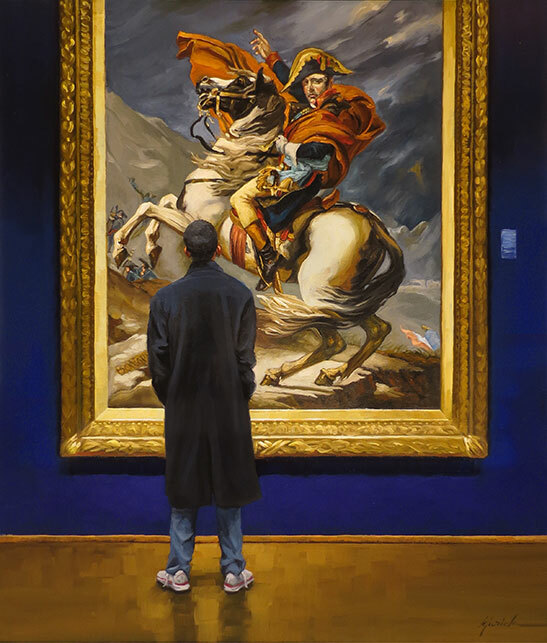 It features one of the most famous paintings of Napoleon Bonaparte crossing the Alps - one of five versions painted by the French artist Jacques-Louis David in the years 1800-1805. Initially commissioned by the King of Spain, this first version depicts Napoleon, in the spring of 1800, leading his army across the Alps, through the Great St. Bernard Pass to conquer Italy and take the territory seized by the Austrians. Although everyone doubted he could cross the Alps in the first place, especially in the spring - with great audacity, he shocked everyone and did it - truth was, the weather was quite nice and he actually rode on a mule, not the triumphant horse as David depicted. Truly propaganda. I could keep going with the fascinating history of this portrait and it's five different versions commissioned by various rulers - not to mention the details of Napoleon's uniform and all his accessories - but it's a lot, so read up on it if you're interested. I will include a bit about the artist David, who painted one of my favorites The Death of Marat. David became a great supporter of the French Revolution and admired Napoleon and when he first met him, he was enamored with Napoleon's face, sketching him when he was able, turning out to be important studies for future commissions - and after Napoleon crossed the St. Bernard Pass, it was requested that David portray him 'calm upon a fiery steed' rather than a mule, and David complied - making him the official court painter of the regime. He went on to paint the extraordinary Coronation of Napoleon, which included the choir of Notre Dame as fill-ins and Pope Pius VII, who blessed David for the masterpiece. It gets complicated after all the revolutionaries, including David, ordered 'off with their heads' of Louis VXI and VXII. When the new king Louis XVIII took over, he granted David amnesty and the position of his court painter, but David refused and fled to Brussels, continued to paint and teach and became wildly popular and rather wealthy until - one night as he was leaving the theater, he was hit by a carraige and died in 1925. As shown in Les Miserables, you gotta watch out for those carraiges. Before I post the link to this new painting going on auction tonight, I have a cool story to tell you. Yesterday I received an email from a woman asking about a painting I had done back in 2013. I replied it had sold way back. She asked for a print. I replied I don't make prints. She then told me the subject, a bungalow I spotted in Nebraska, on our road trip from San Francisco back to Atlanta, was her family's home. In disbelief, I asked her for the street address so I could compare it to my original photo - then with Google street view, I found the house, compared it to my photo and damn, if it wasn't the house! In this big country, in all of the millions of houses in all of the small towns, I painted her house. It still blows my mind. The number one question I'm asked is 'does anyone recognize themselves in your paintings?' And to this day, in twelve years of doing over a couple of thousand paintings, it hasn't happened yet. But someone out there, hundreds of miles away, recognized their house. Absolutely freaking amazing. Okay - back to my new painting. A woman resting on a bench in the Art Institute of Chicago, with her Hopper gift bag full of souvenirs. I got my Hopper on today. What was once a neighborhood restaurant around East Atlanta. 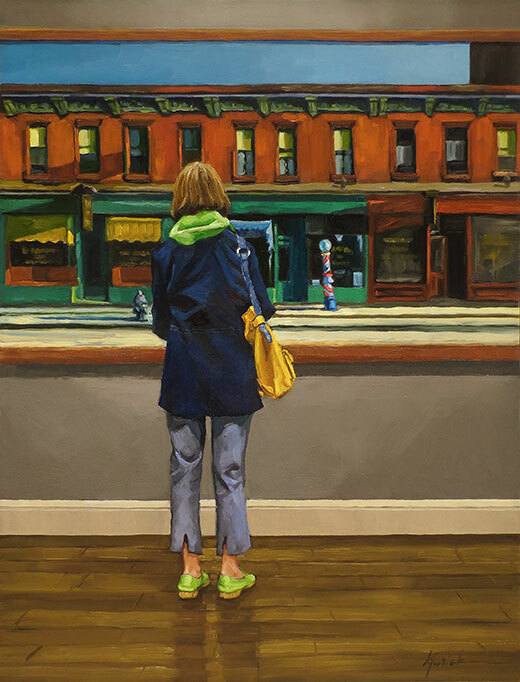 On my list of personal favorite painters, Edward Hopper is in the top 5. When I am lucky enough to stand in front of one of Hopper's paintings in a museum, I always sigh. I stay for a while. I'm always in awe. 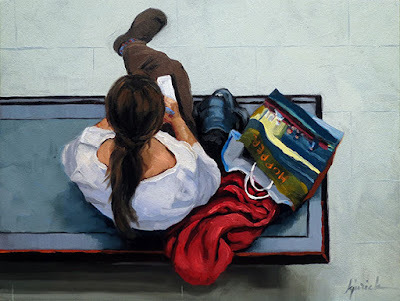 There's a connection with me - his choices of subjects - stately homes in New England, urban scenes, sunlight's angles on windows and sidewalks, quiet, lonely, still scenes of city streetscapes, maybe just one person in the painting or nobody. Delicious colors. 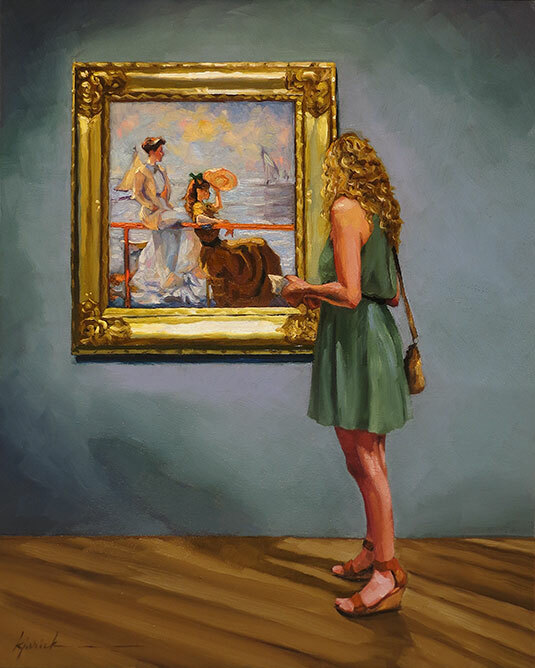 Which brings me to one of my all-time favorite Hopper's 'Early Sunday Morning', which hangs in the Whitney Museum of American Art in New York City - one of more than three thousand works bequeathed to the museum by Hopper's wife in 1968. The 1930 painting is, Hopper said, 'almost a literal translation of Seventh Avenue' - reduced to bare essentials. Each individual window gives hint to the different people in each unit, and although Hopper originally included one lone figure in a window, he removed it, deciding it wasn't needed to convey anything more. It is quintessential 20th century American realism. 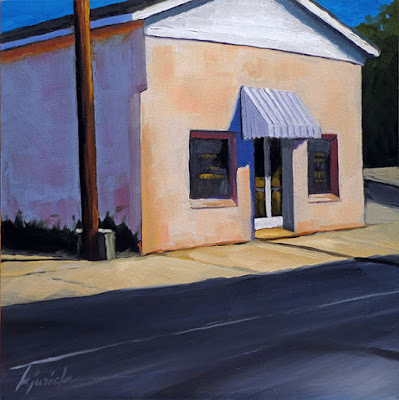 Edward Hopper was born in Upper Nyack, New York in 1882 - his parents encouraged his art, kept him stocked with materials, illustrated books, instructional guides, and in his teens, he was creating watercolors, oils, charcoals and pen-and-inks. He went on to the New York School of Art and Design - became an illustrator which he came to hate, traveled to Europe several times, ended up back in New York reluctantly returning to advertising and illustration. 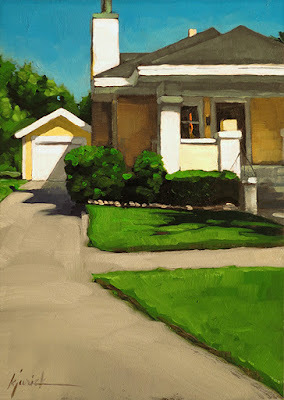 Hopper experienced long periods of inertia, not knowing what to paint - in a funk so to speak. At one point, he turned to etching, producing over 70 pieces of urban scenes of New York and Europe. They are notably the beginnings of his painting subjects down the road - solitary figures, interiors of the theater, nautical scenes, etc. He and his wife worked in the theater, creating backdrops for plays - and I always thought 'Early Sunday Morning' felt like one of those backdrops - as if you were across the street from this typical row of businesses and upper floor apartments. One of my favorite quotes from Edward Hopper - 'Maybe I am not very human - what I wanted to do was to paint sunlight on the side of a house'. I can dig that. I often feel the same.